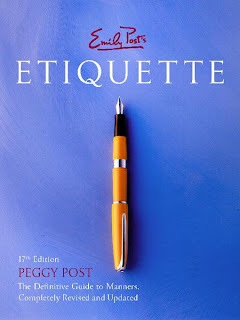 All of the etiquette tips printed on these cards were taken from the 17th edition of Emily Post's Etiquette. I like the idea of this interpretive bible or self-government through the book, hopefully it begins to change and isn't just a strict following of the writer's regulations. It's also good to find out these things about yourself, but hopefully think of it in a positive way that society and values have changed. In order to progress within your performance, there must be an understanding of change.